In the fickle world of restaurants, reincarnations are an everyday occurrence. In New York, no one knows this better than Empire Diner, an iconic four-decade-old eatery in West Chelsea that has recently reopened for the third time. 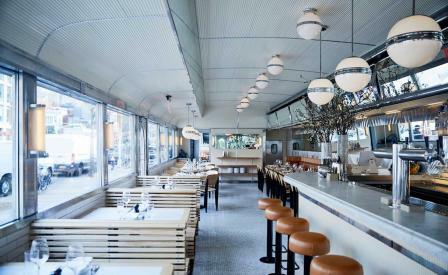 The restaurant’s landmark art moderne exterior, which made a cameo in Woody Allen’s Manhattan, remains untouched, but local firm Nemaworkshop reworked the interiors to deliver a modern interpretation of a buzzy diner without completely abandoning its historic style. In fact, after looking through old photos of the space, the designers decided to reference its original industrial aesthetic in a few ways, including adding stainless steel replicas of the sunburst panels that used to decorate the original diner when it was first unveiled in 1976. But mostly, the two-floor eatery’s current vibe feels contemporary and bright. A portion of the main dining room, set against the bar on the first floor, combines blonde wood booths and carrera marble tables with steel accented pendant lighting, while the the leather banquettes, brick walls, and curvy custom-made wood furniture that adorn the other sections of the restaurant oozes warmth and comfort. This continues to chef John DeLucie’s menu, which partners elevated diner fare (indulgent wedge salad dressed with blue cheese sauce and hearty pastrami sandwich) with light, modern favourites (yellowtail crudo in a jalapeño broth and an addictive beef carpaccio).